Cover part: Double coated PVC polyester textile, 100% waterproof, UV resistant, flame retardant. The thickness is 650gsm,750gsm and 850gsm. Max allowed wind: 80km/hour (0.5kn/sqm). Lifespan under well treatment: 15 years for main frame parts, 5 years for cover part. 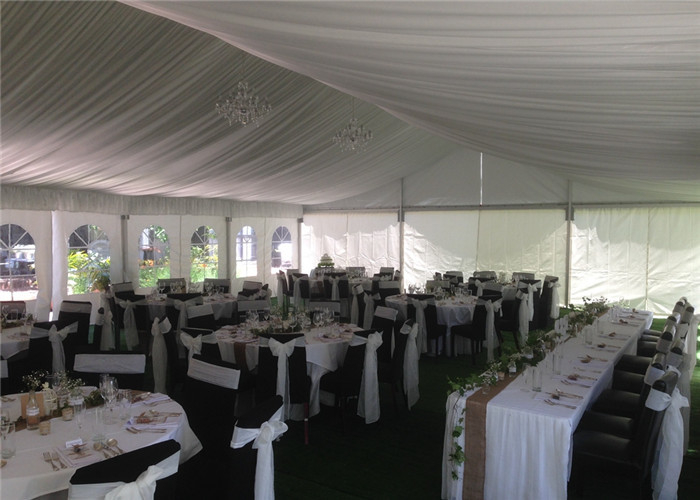 150 people capacity small aluminum tent 10x15m with liners and all decorations for New zealand. It is a size decided by customer for occasional wedding party rental for the lodge garden. For sure the length can be increased freely. Also the width can be changed according to customer’s request. The inner decoration is simple and pure, with beige colored roof liner and curtains. Together with its lodge, it can give their customer good solutions for celebrating a complete wedding and party. This is a small sized tent only used for people below 150 quantity. 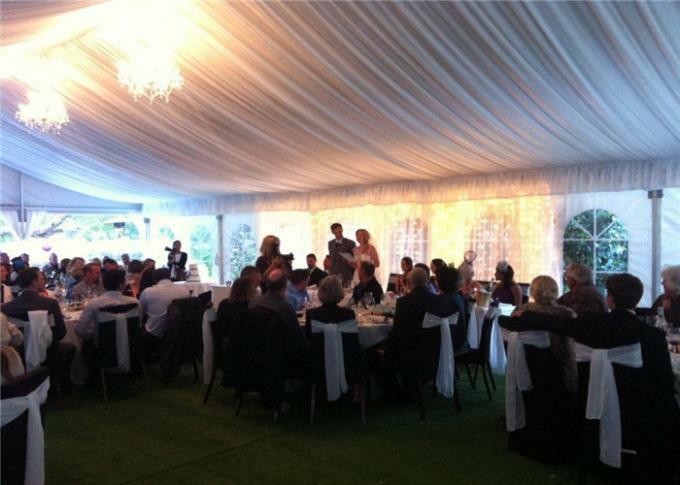 It is a good choice for small wedding party rentals. The decoration for a small tent is very flexible and easy. All these can be done within 1 day. It is applicable for small gathering and small celebration for a holiday and party. 2. Inner space is 100% available, no waste of any inner space. 3. Easy to dismantle and set up. 4. More free for space occupation, you can increase or decrease the length freely. 5. More Eco-friendly as it can be quickly moved away after used.